His kakugan — the veiny, blood-red eye — is triggered. Take a look at the first official movie poster for the live-action take on the cannibal-filled dark fantasy horror Tokyo Ghoul — ‘cause it’s looking back at you. In it, the one-eyed ghoul Ken Kaneki’s kakugan eye has been triggered, which means he’s probably about to use his superpowered kagune, the predatory organ that he can use to rip enemies to shreds. In the grim, dystopian future of Tokyo Ghoul — based on a 2011 manga by Sui Ishida — superpowered cannibals called “ghouls” live hidden among humans, quietly feeding on them from the darkness. After a date goes horribly wrong and protagonist Ken Kaneki is gravely injured, an emergency operation transfers some of the ghoul organs from his attacker into him. The procedure saves Ken’s life at the eventual expense of his humanity, as it turns him into a human-ghoul hybrid who needs to feed on human flesh in order to survive. A “kakugan” is the term for the veiny, blood-red ghoul eye, which activates when a ghoul uses their “kagune,” a ghoul’s external predatory organ that functions as their weapon and claws. In the latest poster for the film, it looks like Ken’s kakugan is on full display. After entering into underground ghoul society, Ken has to learn not only how to use his powers, but he has to maintain secrecy while also feeding his horrific growing appetite. 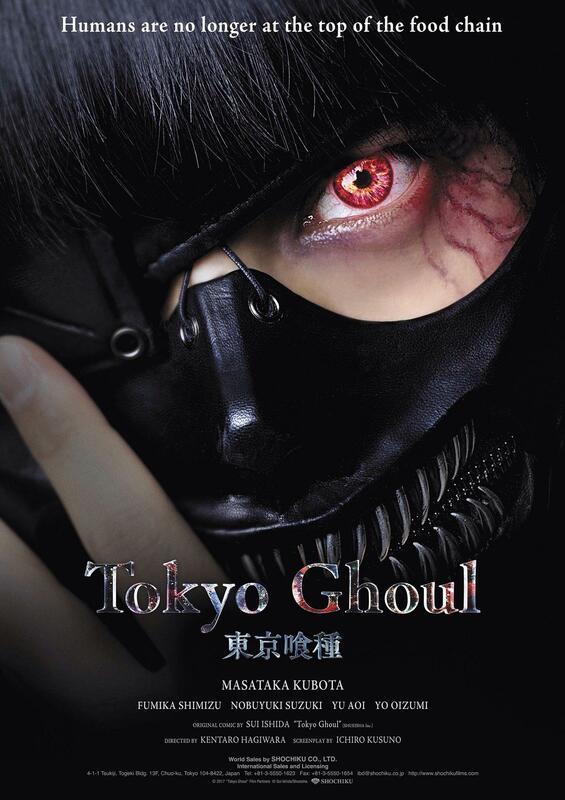 The airing of the Tokyo Ghoul anime in the U.S. was halted in anticipation for the live-action adaptation, which is due out July 29 in Japan.